Nationally, 1 in 5 adults have experienced a burglary and here in Yorkshire the statistic is 1 in 4. Being the victim of a break in is traumatic enough but this research shows that 28% of those will fall victim again in the same property and 8% will experience more than 1 subsequent break ins. See the details here. Despite this, 8% of burglary victims (1.3 million people) did not upgrade their security following the first break in and 16% spent less than £100. So, why do burglars hit the same house again? 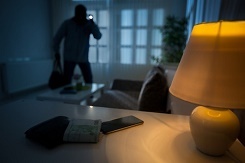 Obviously, preventing a burglary in the first place is the ideal position, however many people do tend to only see the value of home security AFTER they’ve become victims to burglary (and some, not even then if this research is accurate). We would recommend anti-snap locks as a minimum and ideally, a burglar alarm. Of course, having these measures is no good unless you use them. This same research showed that 26% of the burglaries happened as a result of doors not being locked! Whether you’re looking to take preventative measures or beef up security following an incident, we can help. Call us on 0345 833 5543, send us a message or call into our security shop in Wakefield. next What impact does burglary have on victims?